Yonah View Lodge - Upscale vacation cabin near Helen Georgia and Sautee Nacoochee, with beautiful views of Yonah Mountain... stunning! 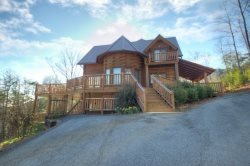 The perfect vacation cabin rental with scenic views of Mt Yonah from your large outdoor hot tub, your spacious deck, living room, upstairs, downstairs... the perfect setting for peace and quiet in a semi-secluded forest with ample room to stretch out, relax, play and rest. When you're ready to experience the festive nearby towns of Helen and Sautee Nacoochee, you'll find them within minutes of your cabin along Hyw 384. Take in an Oktoberfest, taste some exceptional wine at a local vineyard, or get some exercise on one of the many, many forest trails. Close to Helen, GA, this rustic 2 bedroom w/ Trundle loft, is perfect for up to 6 in your family of small group. Included are all the amenities needed for a mountain getaway. 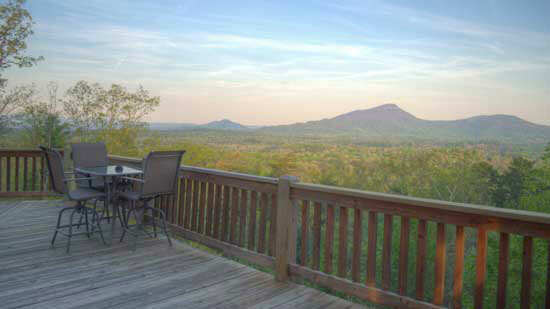 Soak your body in the perfectly located private hot tub as you gaze at the rocky mountain ridge of Mt Yonah. Or step inside and enjoy the warm fireplace in a rustic atmosphere and simply relax. If you do find that burst of energy, take one of the many nearby scenic trails to a waterfall, or go horseback riding or a ZipLine. If visiting some of our excellent local wineries is on your list, Yonah View Lodge is a mere 2 miles to Yonah Mountain Vineyards and their incredible new facility, and .5 miles to Serenity Cellars Tasting Room. Whatever your interest, Yonah View Lodge is the perfect home base for all your adventures. Clean, also felt safe on property. The cabin was nice and peaceful. I only spoke with a young lady on the phone and I found her to be very cordial, helpful and knowledgeable. The weather was perfect, the view was perfect and the cabin was perfect. The whole experience could not have been better.